for me, this is the most wonderful time of the year. The summer months ahead are filled with weddings, graduations, showers, and reunions. I'm looking forward to many such events this summer in particular and can't wait to reunite with old friends as we celebrate the happiest of occasions. If you're planning a wedding or thinking about it in the near future, you'll want to read our "Wedding Advice" article where brides talk about their memorable ceremonies and receptions, and offer helpful hints that you may find useful. A beauty expert also weighs in with skin care tips to follow — well in advance of the Big Day. Quite a few local organizations are celebrating anniversaries this year. The Wellesley Historical Society recently marked its 90th year. In the Forum department of this issue, Wellesley Historical Society Executive Director Erica Dumont writes about new initiatives the Society is planning that include moving to larger headquarters better suited to hold its extensive collections. Wellesley and Weston have rich histories, and our residents are very fortunate in that we have flourish- ing historical societies with dedicated staff and enthusiastic volunteers to serve as stewards of the past. If you haven't done so already, I encourage you to learn more about the Weston Historical Society and the Wellesley Historical Society, consider a membership, and discover how interesting the histories of our towns can be. Both societies offer programs, tours, lectures, exhibits, and social events. You can visit www.wellesleyhistoricalsociety.org and www.westonhistory.org for more information. Often on our pages, you'll find photos courtesy of both historical societies, and we are very appreciative to be able to access these precious resources as we strive to keep history alive on the pages of our publication. In this issue, you'll see a photo from the past and have the chance to read about William T.G. Morton, a contro- versial figure who claimed to be the father of modern anesthesia. The article is a fascinating account of the first operation to use ether and the paintings commissioned to commemorate that remarkable event. Also in this issue, you'll meet a number of individuals who give their time and resources to help others: the Beyond Boston volunteers; Sue Kisiday and Christina Pavlina, who started a divorce support group for women; the founders of Neighbor to Neighbor; and the clergy profiled in the series "Our Religious Leaders," to name a few. 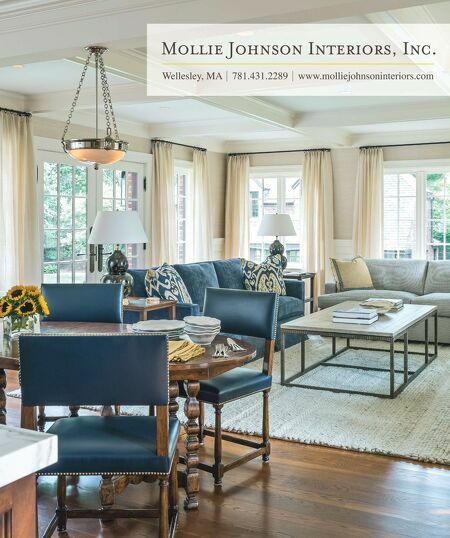 I hope you find time during your busy summer days to sit back with the magazine and learn more about the incredible people who call and called Wellesley and Weston home. 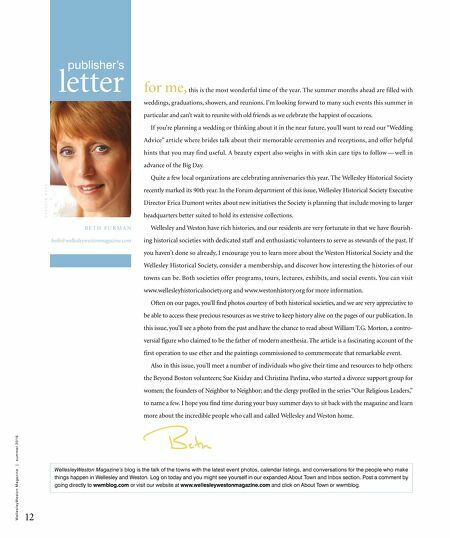 12 W e l l e s l e y W e s t o n M a g a z i n e | s u m m e r 2 0 1 6 publisher's letter B E T H F U R M A N beth@wellesleywestonmagazine.com C A R O L Y N R O S S WellesleyWeston Magazine's blog is the talk of the towns with the latest event photos, calendar listings, and conversations for the people who make things happen in Wellesley and Weston. Log on today and you might see yourself in our expanded About Town and Inbox section. Post a comment by going directly to wwmblog.com or visit our website at www.wellesleywestonmagazine.com and click on About Town or wwmblog.